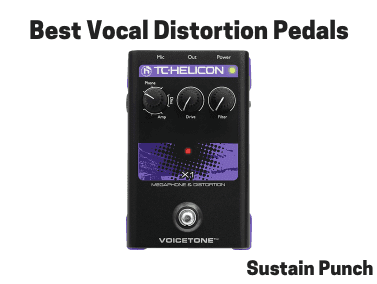 In this article we’re going to be discussing the best vocal distortion pedals in 2019. However, before we jump into exactly what processors are featured within the list, we want to briefly talk about what exactly a vocal distortion processor does, and when one might be used. What are Vocal Distortion Pedals? Vocal Distortion is a vocal effect used to muddy the sound of a vocal signal, for both live and studio vocal takes. However, with that being said, Vocal Distortion Pedals are more commonly used for live vocal performances since they provide immediate vocal effects, with live performances not allowing the singer the luxury of singing multiple vocal takes to get the perfect sound. Generally, vocal effects such as Vocal Delay, Vocal Compression are supporting vocal effects within multi-effect vocal processors. Therefore, we have provided the best vocal effects pedals that come with Vocal Distortion. These kinds of processors are generally used within a live performance environment, with it being somewhat difficult to create this effect naturally, unless the actual vocal signal is overdrive, and hence feedback would likely occur. It’s unlikely that this kind of unit would be used within a studio-environment, with it being easier to be achieved by a studio-quality rack-mountable processor or DAW. However, it may be useful for the ‘basement studio’ user who wants it for both live and studio recording use. Inability to save presets, therefore any modifications to these presets must be done via the on-pedal filter knobs. This vocal distortion/megaphone effects unit is perfect for someone looking for a less expensive vocal distortion pedal, with the dual use of only distortion and megaphone effects, as opposed to a multi-effects pedal. This vocal distortion processor is ideal for use in practices and small live performances. After the feedback we’ve received about this unit, we would recommend this to a hobbyist singer/songwriter/musician. 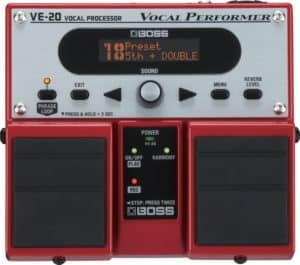 The BOSS VE 20 Vocal Performer is not primarily a vocal distortion pedal, it’s essentially an All-in-One solution, and is designed and produced by Boss, so you know it’s high quality. The pedal is 1.6kg it’s not the lightest in the world, but it more than makes up for it in its ability to add such creative vocal effects such as radio effect, strobe and vocal distortion effects.